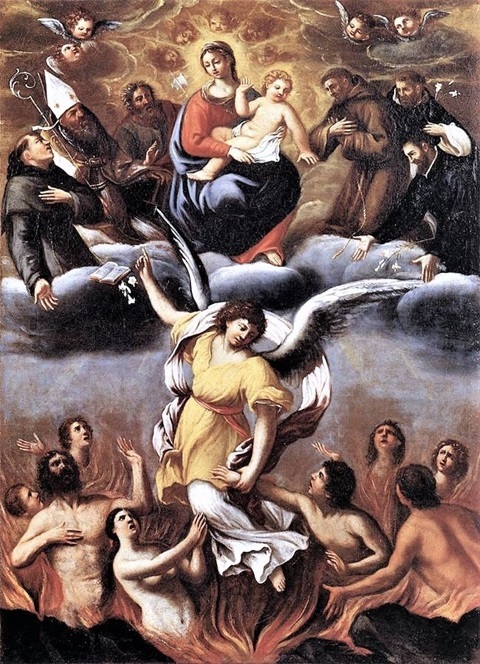 Click here, for more approved reading material on the Holy Souls in Purgatory, and to increase your devotion towards them. Began on the third, and terminated on the fourth, day of December, MDLXIII., being the ninth and last under the Sovereign Pontiff, Pius IV. November 1: All Saints, Double of the I Class. November 2: Commemoration of all the Faithful Departed, Double. November 4: FIRST SATURDAY/St. Charles (of Borromeo) Bishop and Confessor, Double; Commemoration of Ss. Vitalis and Agricola Martyrs. November 5: XXII Sunday after Pentecost, Double. November 8: Commemoration of the Holy Four Crowned Martyrs. November 9: Dedication of the Archbasilica of the most Holy Saviour, Double of the II Class; Commemoration of St. Theodore Martyr. November 10: St. Andrew Avellino Confessor, Double; Commemoration of Ss. Tryphon, Respicius, and Nympha Martyrs. November 11: St. Martin Bishop and Confessor, Double; Commemoration of St. Mennas Martyr. November 12: XXIII Sunday after Pentecost, Double; Commemoration of St. Martin I Pope and Martyr. November 13: St. Didacus Confessor, Simple. November 14: St. Josaphat Bishop and Martyr, Double. November 15: St. Albert the Great Bishop, Confessor, and Doctor of the Church, Double. November 16: St. Gertrude Virgin, Double. November 17: St. Gregory Thaumaturgus Bishop and Confessor, Simple. November 18: Dedication of the Basilicas of Ss. Peter and Paul, Greater Double. November 19: XXIV Sunday after Pentecost, Double; Commemoration of St. Elisabeth (of Hungary) Widow; Commemoration of St. Pontianus Pope and Martyr. November 20: St. Felix of Valois Confessor, Double. November 21: Presentation of the Blessed Virgin Mary, Greater Double. November 22: St. Cecilia Virgin and Martyr, Double. November 23: St. Clement I Pope and Martyr, Double; Commemoration of St. Felicitas Martyr. November 24: St. John of the Cross Confessor and Doctor of the Church, Double; Commemoration St. Chrysogonus Martyr. November 25: St. Catherine (of Alexandria), Virgin and Martyr, Double. November 26: XXV (Last) Sunday after Pentecost, Double; Commemoration of St. Sylvester Abbot; Commemoration of St. Peter of Alexandria Bishop and Martyr. November 29: Commemoration of St. Saturninus, Martyr. November 30: St. Andrew Apostle, Double of the II Class.